A fire alarm system is a network of three main components: an initiating device, notification device and a control panel. 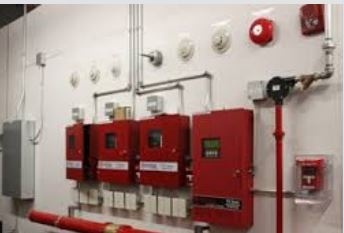 The purpose of any fire detection system is to send an alert immediately to the buildings occupants and the appropriate authorities. The quicker the response, the easier it is to solve any fire issue. A notification device sounds off some type of alarm or warning sound such as a siren, horn, lights, or any other type of sensory alert to ensure any person within a facility will understand the alert that is taking place. The control panel is the intelligence of the system and it varies based on the system that is installed. There are two types of systems that a control panel will operate with, a conventional or addressable. To learn more about these systems, please click here. Any qualified professional will be able to provide valuable assistance by reviewing your businesses operations and systems and can provide guidance and recommendations the best fire alarm system to meet your safety needs. Our Product Line Managers, Joe and Todd go into great details explaining more about fire alarm systems and cables. Click the link below to see for yourself!